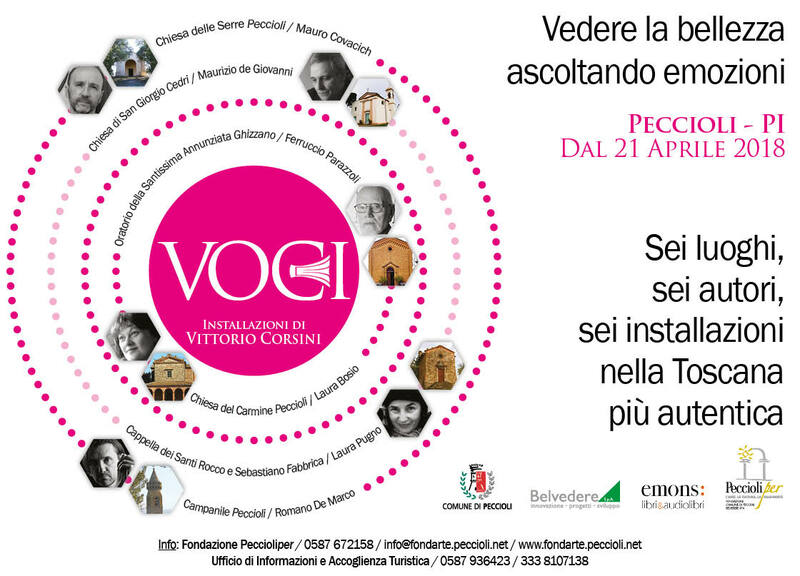 On Saturday 21, 2018, VOCI [VOICES] was inaugurated in Peccioli. It is a project of the Municipality of Peccioli in collaboration with the Foundation Peccioliper. The unpublished stories of six of the most famous contemporary Italian writers – Laura Bosio, Mauro Covacich, Maurizio de Giovanni, Romano De Marco, Ferruccio Parazzoli, Laura Pugno – and the artistic practice of Vittorio Corsini give voice and form to six new permanent installations that, starting from the town of Peccioli, wind through the surrounding villages, creating unexpected paths. Nestled in a hilly landscape with an ancient flavour, Peccioli combines the charm of medieval Tuscany with the idea of a real widespread museum. For about thirty years the Municipal Administration has carried out a project that intersects contemporary art with the territory and its identity. Thanks to a series of focused interventions by contemporary artists (among whom Nagasawa, Dubosarsky-Vinogradov, Garutti and the same Corsini), over time a sort of open-air museum has been created. This one has established new relationships with the surrounding landscape, enriching it with elements that intertwine with local history and traditions. VOCI stems from the desire to create within the territory of the Municipality of Peccioli an artistic and literary journey that leads to the discovery of new and unexplored places. The narrative voices are those of some of the major contemporary authors. Each of them was asked to build a piece of this path, writing a story inspired by the encounter with some religious buildings of the territory, mostly built near small villages, each with its own history and identity. Transposed in an audio form by the same authors, these stories return to the place that generated them and are accompanied by six new works specifically conceived by Vittorio Corsini and installed inside these places: the Bell Tower of the Church of San Verano [Saint Veranus], the Church of the Madonna del Carmine [Our Lady of Mount Carmel] and the Church of the Serre in Peccioli, the Church of Saint George in Cedri, the Chapel of the Saints Roch and Sebastian in Fabbrica, the Oratory of the Santissima Annunziata [Most Holy Annunciation] in Ghizzano. Vittorio Corsini's research extends through three decades of intense activity in the field of sculpture and installation. From the beginning he focused on the concept and ways of living, on the dynamics that affect life in domestic and public spaces and on physical space as a metaphor of the encounter between the individual and the community. Essential in the forms, the work of Corsini becomes the vehicle of an emotional content and generates the conditions for a different experience of daily life. Over the years numerous public art interventions in urban space have seen the artist working in inhabited centres by the construction and design of courtyards, fountains and gardens, conceived as generators of encounters and caused by the ordinary practices or the local habits. “We need to activate new territories”, says Corsini, “the artist is like an explorer who makes visible these new territories, which today are not made of materials, techniques, languages, but rather of manners, relationships, energies […]. Public sculpture for me is something that activates a space. It is important that the work functions: it must be crossed, it must know how to dialogue, it must obtain a human and social dimension, of exchange and of relationship”. Reproduced on a carpet of colored sawdust rather than projected as a beam of light on the walls of a room, the word has always been one of the founding elements of Vittorio Corsin’s research. In 2007 he collaborates for the first time with a writer for “Chi mi parla” ["Who is talking to me"], a lamppost with a seat that tells the stories of the inhabitants of the place. In 2011, with the help of two writers, he realized for the MACRO of Rome "Xenia", a resting place cut out on the terrace of the museum, where the vibrations of a fence transform the stories into sound. The works that Corsini conceives for VOCI define a space, create relationships, predispose to the listening and, as in the Roman installation, give tangibly a voice to the narrations of the six authors. “E non per vendetta” [“And not for revenge”] is the title of the test by Laura Bosio. Narrator of the soul, in this story as in his books she chooses a woman as the protagonist of the story. Liuba is a Ukrainian girl who escapes from the violence of the war. She comes to Peccioli and thanks to the help of the parish priest of the Carmine Church she begins a new life. Corsini captures a choral dimension in Bosio’s story and prepares two semicircular benches facing each other at the entrance of the church. The element placed in the centre spreads the narrating author's voice. Mauro Covacich's writing intensively dialogues with art, as evidenced by the pentalogy that he creates between 2003 and 2011. “The church porch is protected by two holm oaks. On the trunk of both an old wound. Two twin trees castigated by the same lightning had survived the same fire, on top of this hill that looks like a cloud suspended over the countryside, and instead it is land, instead it is Tuscany”. Thus Covacich begins his story, leading us inside the Church of the Serre in Peccioli. “Credo” [“I believe”] is an interior monologue, a lucid secular, ruthless, sometimes desperate prayer that nevertheless does not abandon hope. Corsini visually restores the rigour of Covacich's writing by placing stone benches inside the church. A wooden axis that vibrates "speaks" from the top of a scaffolding of hypothetical works in progress. Maurizio de Giovanni is the author of a successful series of novels that have as main character the commissioner Ricciardi, as well as the author of another equally famous saga, I bastardi di Pizzofalcone [The Bastards of Pizzofalcone], a tendency of the police procedural set in Naples. For this project he writes Il segno della Madonna [The Sign of the Madonna]. The story, set inside the Church of San Giorgio in Cedri, talks about an improbable conversation between two aged characters, Giuseppe and Guido, as to the “disappearance” of a precious painting: the Madonna of Humility by Beato Angelico. “The two old men are very different from each other. One stands straight, composed, with the gray hair pulled back, the horn glasses and the hands in his lap. The other is a bit curved, with the untidy white hair on the nape and shoulders, wearing a kind of dark coat. His hands shake a little (…)”. The installation by Corsini is an invitation to meditate on the diachronic paradox put on by the writer. The story of Romano De Marco is entitled The Moment of Truth. De Marco is one of the most appreciated Italian writers of crime, noir and, more recently, thrillers. The crime is committed during the visit of a famous and aged writer, Professor D’Eramo, to one of the symbolic monuments of Peccioli, the bell tower of the Church of San Verano. “It is the story of a girl who committed suicide, throwing herself from one of these openings”. D’Eramo looked at him, finally intrigued. “She was twenty years old, and she was from here, from Peccioli. Since she was a child she dreamed of becoming a novelist (...)”. Corsini runs De Marco’s voice along the handrail of the stairs that lead to the tower. The sound accompanies us ideally up to the floor of the big bells, where De Marco unveils the end of his story. Ferruccio Parazzoli is one of the most significant contemporary writers, his novels are characterized by a constant attention to ethical problems and by the overturning of the fantastic and metaphysical into the humble everyday life. To prepare people to listen to the narration of Parazzoli, Prima della notte [Before the Night], Corsini places two chairs and a statuary marble sculpture at the bottom of the Oratory of the Santissima Annunziata [Most Holy Annunciation] in Ghizzano. The chairs placed nearby create an intimate and private atmosphere that characterizes the conversation between the two protagonists of the story: “(…) What you see”, the professor continued, “is the Holy of Holies, my private oratory. Peace reigns here. Would you like to know what covered these walls before this colony of Saints proliferated? Books, only books, by now useless books. The metamorphosis originated many years ago when...”. He took off his glasses, leant his head against the back of the chair and began to tell, as if he were telling a dream (…). “Every author has obsessions that reappear: I often go back to writing about nature, about the relationship between man and animals, about the transformations of the planet, but also about the relationship we have with death and demise. A recurrent setting for me is the forest”, says the poetess and writer Laura Pugno in an interview for the Prize Campiello 2017. L’incendio [The Fire], the tale that he writes for this project, is the story of Pietro, a man who sets fires because he is convinced to find, in the midst of the flames, the face of the missing daughter. He knew it was the last time, he knew that by setting that fire – somehow, he knew it – he would die, although, even now, on the lawn of the church, with the wet beneath and the sky above, his burns were not deadly. He closed his eyes, felt something (…). The altar of the Church of the Saints Roch and Sebastian in Fabbrica is surrounded by a tangle of branches and leaves. If we sit on the first bench on the right, the bush lights up with the red of the fire and, from the altar that vibrates, the author’s voice spreads. VOCI, Vittorio Corsini with Laura Bosio, Mauro Covacich, Maurizio de Giovanni, Romano De Marco, Ferruccio Parazzoli, Laura Pugno. A project of the Municipality of Peccioli in collaboration with the Foundation Peccioliper. Publishing project by Sandra Furlan. Chiesa del Carmine, Piazza del Carmine, Peccioli Chiesa delle Serre, Le Serre, Peccioli Chiesa di San Giorgio, Via di Cedri, Peccioli Campanile della Chiesa di San Verano, Piazza del Popolo 1, Peccioli Oratorio della Santissima Annunziata, Via Santa Maria, Ghizzano Chiesa dei Santi Rocco e Sebastiano, Via Vittorio Veneto, Fabbrica. Nei giorni di sabato 21 e domenica 22 aprile sarà a disposizione dei visitatori un bus-navetta gratuito per visitare le opere installate fuori dal centro storico di Peccioli. Il servizio osserverà i seguenti orari: sabato dalle ore 14.30 alle ore 17.30 (*); domenica dalle ore 10.00 alle ore 17.00 (*) [*partenza ultimo tour]. Gradita la prenotazione. Fondazione Peccioliper [Foundation Peccioliper], tel. +39 0587 672158, from Monday to Friday 9am-1pm / 3pm-5pm; info@fondarte.peccioli.net; www.fondarte.peccioli.net; Ufficio informazioni e accoglienza turistica del Comune di Peccioli [Information and Tourist Office of the Municipality of Peccioli], tel. +39 0587 936423, Tuesday, Thursday, Friday 10am-1pm and Wednesday, Saturday, Sunday 10am-1pm / 3pm-7pm.